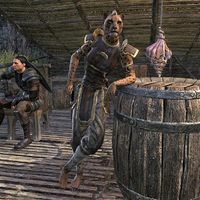 Zadaza is a Khajiit who can originally be found in Lilmoth. You'll find her near the western gate along with Kirstaleth and Varo Hosidias. She is a veteran associate of Famia Mercius of Cyrodilic Collections and has taken part in many of her expeditions. Zadaza: "Ah, fresh meat! More gold for Zadaza when you die!" "So Famia reels in another adventurer, eh? This one admits, you seem stronger than most. Hmm. Zadaza gives you … two in three chance of surviving. Fair odds, yes?" Is this xanmeer really that dangerous? "Ha! Only for wide-footed bumblers. Unfortunately, Famia has a weak eye for talent, and Murkmire is full of clumsy risk-takers. But don't worry, walker. This one has been on five expeditions with Famia and only seen people eaten by salamanders twice!" Good to know. Any advice on how to avoid that sort of thing? "Hmm. Only this: when we find treasure, take no more than you can carry comfortably. A heavy purse will make you slow, and being slow will make you dead. Oh, and if you see Zadaza running, you should run, too—in the same direction. Simple!" "Any other questions for Zadaza? Or do you simply wish to get to the running, dodging, and screaming?" "Ask away, walker! Our leader, Famia, knows more about the ruins than Zadaza, but Zadaza knows more about not getting eaten by crocodiles. This one will let you decide which is more important." What can you tell me about Famia? "Famia is very smart—not clever, though. Zadaza risks losing her tail because she is bold, and beautiful, and greedy. But Famia risks all because she loves the lizard-folk. Do not ask this one to explain why. It makes no sense to Zadaza." What kind of dangers will we find in the xanmeer? "Ha! Rajhin's shadow, how much time do we have? Sink-sand, poison darts, blades of all sizes … oh, and falling rocks. And also poison gas. This one is probably forgetting a few things. Just assume that everything in the xanmeer wants you dead." What type of treasure are we looking for? "That depends on what you value, yes? Famia looks for this Kajin-Jat Crystal. Zadaza looks for things that are light and numerous—baubles and ancient coins, you see? Some look for heavy golden idols. They tend to wind up squished or in pieces." No questions from me. Let's get going. / All right, I don't have any more questions. I'm ready to explore the xanmeer. "Confidence! Initiative! Excellent! These are wonderful traits that will almost certainly get you killed. Do not worry—Zadaza will ensure that your legend lives on by scooping up your bloody gear and selling it. "Zadaza hopes you are not too fond of your boots. The marsh eats boots only slightly less often than it eats people. Hopefully we will see you at the xanmeer soon. If not, well … this one is sure you will make some lucky crocodile very happy." While you search with Famia for the others, Zadaza will make her way through the complex until she meets up with you again after you drive off the spiders attacking Varo. Varo Hosidias: "That all of them? Good." Zadaza: "Jone's bumpy arse, what happened in here?" "The crystal is near! Come!" Kirstaleth: "Varo! Don't move! I'll get down there to heal you—somehow." Zadaza: "Famia's crystal is through the next door. Hop down, yes? This one will follow." Zadaza: "Dark moons, a trap! Lift those paws, walker! Zadaza will disarm it!" Zadaza: "Exhilarating, yes? This one thinks the door is unlocked now. Give it a push." When you enter the chamber with the statue that holds the crystal, Zadaza will warn Famia to be careful. The statue holding the the crystal then crumbles and the Ixtaxh Voriplasm emerges. Once the voriplasm is destroyed and you have escaped the xanmeer, Zadaza is rather blasé about the experience. "Another temple conquered, eh? Closest call this one has seen in years, though. You did well in there, walker. Zadaza thinks you might have a future in this business!" She and the rest of the expedition will banter with Famia about their past expeditions, though Kristaleth and Varo decide to sit the next one out. Since you last saw her, Zadaza was investigating the disappearances of fellow Cyrodilic Collections members but was captured herself. She can be found with her fellow captives in the small prison corral at the Blackguard Caravan, once you open the gate she will be the first out. Zadaza: "Run, you mud-legs! Zadaza is done with this place!" Xureiik: "So, these dryskins are good for something after all." Kirstaleth: "I hate this swamp! I'm never coming back!" "Rescued! That is what they say! Brave, beautiful Zadaza rescued by the new blood. Ziss'vo! Varo will never let this one hear the end of it." You're mad at me for saving you? "Oh, do not get your tail in a twist. Zadaza is not mad—just disappointed. This one was moments away from mounting a daring escape when you arrived. The stuff of legends! Still, we work with Famia. Zadaza will get another chance before long, yes?" Zadaza will be with her fellow Cyrodilic Collections members in Root-Whisper Village to witness the rebirth of a tribe and a Hist tree. She will be grudgingly impressed by your exploits, "A villain defeated, a Hist tree renewed, a tribe reborn …. This one will admit, she is impressed. Do not let it go to your head, though! If there is one thing Zadaza cannot stand, it is vanity." She doesn't exist in-game until Famia Mercius sends you to speak to her.